Ride for two and a half hours on a motorcycle, so that we can stand in line for three more hours, just to eat BBQ? That is what it takes to eat the Texas Monthly’s #1 ranked BBQ joint in the world and rising star of the cue world, Franklin BBQ. This gem sits in a small lot just east of the state capitol building in Austin Texas and has placed itself quickly among the legendary Texas BBQ establishments. 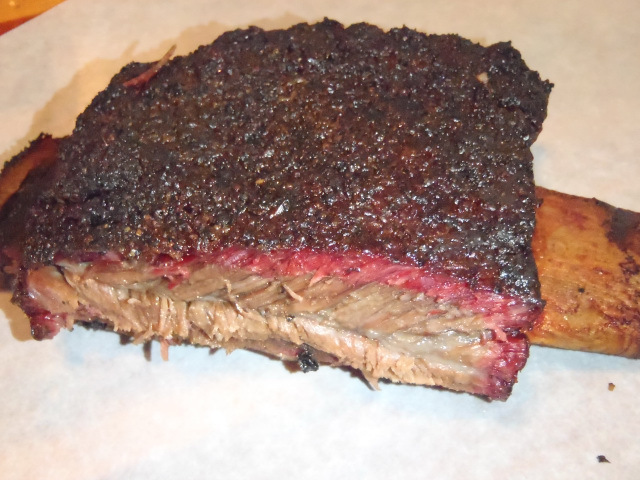 Starting from a small trailer in late 2009 and moving to their current location in 2011, they have ridden and led the recent wave of fantastic new barbecue establishments in Austin. The nucleus of this recent renaissance was John Mueller, son of Bobby Mueller of Louie Mueller BBQ in Taylor Texas. 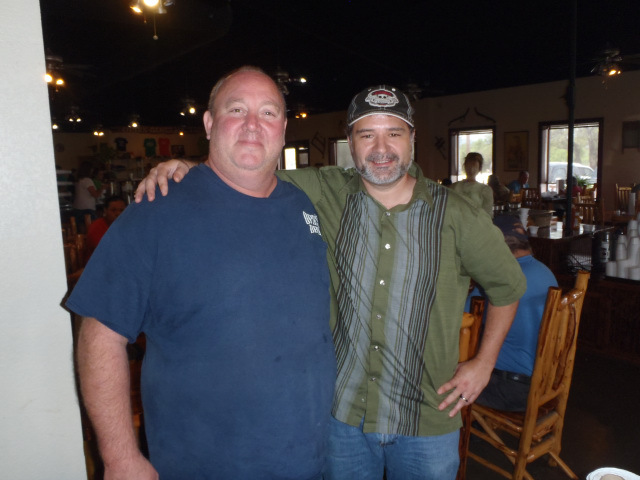 The lineage from Taylor includes John Mueller, Stiles Switch BBQ and Brew (pit master Lance Kirkpatrick formerly worked at Louie Mueller), and Franklin BBQ (Aaron Franklin worked for John Mueller). 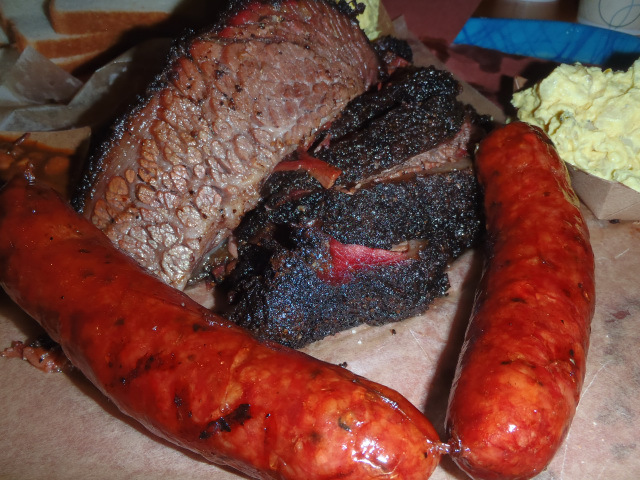 LA Barbecue (whose pit master once worked at Franklin), also is intertwined in the BBQ scene in Austin as it sits on the location of Mueller’s first Austin establishment. We wouldn’t have time to sample all of the new joints in Austin, our plan was four stops in two days but our focus was Franklin BBQ. The Texas Monthly BBQ rankings had just been announced via Twitter that week and I figured that with lines already 2+ hours long, once the magazine hit the streets it would be even crazier. Thus, our primary goal would be to check Franklin off our list. I knew we would have to wait in line, and probably would need to be there by 8:30 for an 11am opening. Because of this I wanted to get a folding chart, but one that I could carry easily on the motorcycle. A little web research revealed the “pocket chair”, and although it had fairly lousy reviews, it looked like it would be precisely what I needed. When I had looked up some available options for purchase, I saw that they were currently at Big Lots for $3. However, visits to three stores around my hometown came up with nothing. At 5:30AM I warmed up the BMW and we headed north to Magnolia. We then followed FM1488 over to Hwy 290. On FM1488 we saw some preventative brush burning as they were still cutting down trees destroyed from the forest fire there in 2011. We left while it was still dark but the sky lightened to a slate color by the time we rolled up the ramp onto 290. We took no scenic routes outbound this time as we wanted to get as much sleep as possible before starting our journey to Austin. We zipped along 290 through the usual towns, topping off the gas tank in Carmine which would be our only break until Franklin’s was in view. Riding past City Meat Market in Giddings, a Texas Monthly top 50, I thought it ironic the number of perfectly good places we would pass over on the way to our destination. Nearing Austin, Hwy 290 Now turns into a short toll road. I hadn’t set the BMW up on toll tags yet and they only offer automated or mail-in options on this toll road so we stayed on the frontage road for a couple of stoplights before entering back onto the freeway. Turning south onto IH 35 it wasn’t long before we rode past the old airport and the University of Texas football and baseball fields. With the state capitol in view we took the 12th/11th street exit. When I pulled up to the stoplight at 12th street I had a reminder that I was back in my hometown; a beggar with a sign that read “Spaceship out of fuel”. We came up on Franklin quickly; it’s just one block east of IH 35 but we needed a restroom break. I continued onward on 11th in search of a suitable location and although there were sprinklings of new high end housing encroaching into the established neighborhood, we were soon riding past painted murals and convenience stores with pretty stout iron bars protecting the storefronts. None at face value looked particularly enticing to us so I doubled back and we stopped at the CVS at the corner of 11th and IH35. We grabbed a Coke, took care of our needs and then parked the bike at Franklin’s at 8:24 AM. At this point the line was 30 people long so we grabbed our spot in line. Leslye took out her Nook and I scouted around the place, checking out the pits in the back that were working full speed. They had one more under construction that looked like it would be ready very soon. They were fully aware of the Texas Monthly ranking and thankfully were ramping up for what will truly be insanity in a few more weeks. The magazine will hit the streets by Memorial Day, and the fevered pitch will only continue to grow. 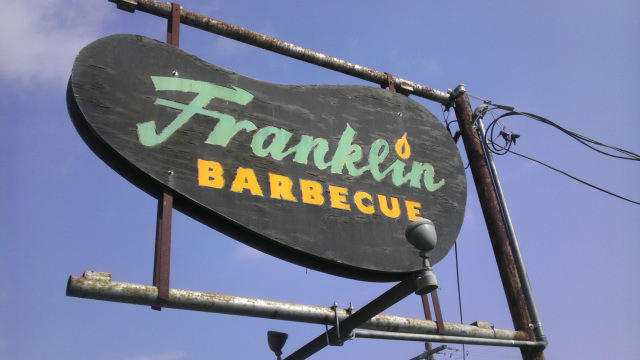 If you’re a local and considering visiting Franklin BBQ, then I certainly recommend stopping by during the week. On the weekends the tourists and out-of-towners (like us) come in, along with large families. Events such as football games, graduation, and other similar activities can also substantially increase the size of the line. There is another option. AS i understand it, a small amount of meat is available on a preorder basis. Email them ahead of time and you may get the chance to simply drive up at 10:30am and get your bounty to go without even waiting in line. I believe the minimum quantity is 5 pounds, and while you don’t the full experience of Franklin BBQ you do get the same food. I will say though, especially for your first trip, you should have the full experience of the line. The line is very much a part of the Franklin BBQ experience. A friend of mine, Chris, compared it to a Southpark episode where they had “the line ride”; where the entire ride was in actuality the line itself. 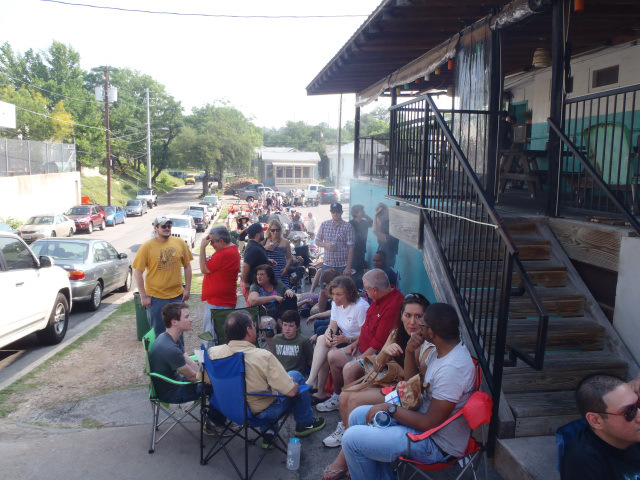 In some ways, Franklin BBQ is about the experience of the line. Get there early and be prepared. You’ll want a chair or two, something to read or listen to, most likely a phone or computer with internet access, and don’t forget sun screen; unless your one of the first 40 or so in line, you will be in a parking lot with no shade. If you are prepared and know what to expect, the hours of waiting becomes an event in itself. Meet your neighbor, find out why both of you made the trip, and make the most out of your morning. When we pulled up an entrepreneur across the street was renting chairs for $5 and since I failed in my quest for the Pocket Chair I gladly rented one. In chatting with him he mentioned that Franklin’s order for butcher paper virtually doubled this week from the previous, and that he was there when Texas Monthly was taking pictures for their best BBQ article. They took one of him, and he was hoping to be in the magazine. Kudos for free enterprise and kudos to the chair guy; he was friendly and interesting. I checked the issue when it was released and unfortunately he was not featured, but he was pretty cool to chat with. The line grew quickly and my nephew Cory arrived next so we caught up on various topics as the temperature continued to rise along with the sun. My sister Cheryl, and Ernest were the final two in our party and they arrived as the line now had stretched to the end of the parking lot. At 9am the line was 76 people deep. By 9:30 it had grown to 139 but from there on out it grew at a much slower pace. A representative came out asking what we would be ordering and the quantities so they could estimate the usage as well as predict at what point they would sell out. I heard her tell the folks at the back of the line who arrived after 9:30 that it would be between 1:30 and 1:45 before they would get it eat. We would be in the “first wave.” Closer to opening time at 11 the line may not have gotten significantly longer, but it did grow fatter, as individuals and couples would be joined by the rest of their group. Around 9am the Franklin staff began to mill around. Tables were prepped with their three types of sauce, recycling bins set out for those who brought drinks to consume while waiting, and other preparation would continue inside until 11AM. During our wait Daniel from Franklin passed through the line a few times with soft drinks and beer for sale. He had moved down from Fort Worth and was surprised by my sister’s tales of our roots here in Austin and memories such as seeing Stevie Ray Vaughn at the Armadillo World Headquarters. While I missed my chances to see Vaughan myself, I was born and raised in Austin as well. Austin has really grown and the changes often catch me off guard when I visit. Just across the street from Franklin, two large apartment/condo complexes were rising up, transforming the 11th street area to a more dense, hip, urban community – for better or worse. Waiting in line we met fellow line stander Kenneth, formerly of California. It was not his first rodeo here though. He had heard of Franklin through coworkers, and like quite a few people in line he was not yet aware of the Texas Monthly article. My imaginary bet with him was that within the next two weeks there would be at least one or two crazies camping out overnight. We continued to talk about the fine variations of barbecue including our personal favorite restaurants and style of BBQ. At the very top of the pack there is a very small handful that can cook to perfection and do it consistently. I believed Franklin could be one of those, but was not sure if it was so much above the others that the multi hour wait would justify eating here more than once or twice. From Austin, you can get to Louie Mueller or Snow’s in less time than it takes waiting in line at Franklin. In fact, it looks possible to complete the round trip plus eating time on a good day. In addition to those two, La Barbecue, Stiles Switch, and John Mueller have been getting rave reviews and all have a lineage back to Louie Mueller in Taylor. So other than fuel savings, the question begins to become; is this really worth it? I will say that eating at Franklin is an event and not just a meal. Since they run out of food daily, proper planning and preparation is essential to enjoying the experience. The first person in line on this day was there at 7am, but the second person didn’t arrive until 7:45. From then until our arrival 28 more people filled in the gap, but remember that some of these folks were placeholders for additional guests, so while it may look like only a handful of people may be in front of you, the wait time can be longer than expected. I was told they started the day with 1,500 pounds of raw meat. That’s significantly more than Snow’s but they still sell out daily. The one thing different about this style of joint though, is that essentially it is one long wave of cue to serve. I would say this is “easier” to cook than restaurants that serve throughout the day. Managing the fluctuations of an early lunch, the true lunch rush, and the lull between lunch and dinner can make it difficult to provide consistently top quality cue. By no means am I saying it is easy to provide elite BBQ through one long service, but I do believe that it is an added complexity to do so throughout the day. The brisket here was astounding. A nice heavy salt and pepper bark hit my taste buds which was followed by the perfectly rendered fat and ridiculously moist meat. I’d give a slight edge to Louie Mueller based on my last visit, but this was nothing less than elite. The sausage (only one option) was smoked to absolute perfection. There were nice markings on the outside, and when I bit into the casing it had a great snap and juice literally shot across the table. While the internals were a bit coarsely ground like I prefer, I’d put them a notch below my favorite though. I think it would be awesome to have Franklin smoke some of my favorite sausage from other joints, but I know that’s not possible. The potato salad was heavily mustard based, and had decent sized chunks of potato. It was very good. The ranch beans had obvious chunks of brisket floating in the stock but were too spicy for almost everyone in my crew. Most of them went “woo!” after taking a bite. Some complained that after eating them, they were less able to judge the rest of the meal; this is why I always eat my brisket and sausage before the sides. I do wish they would have cut down on the spice, just a bit too hot. 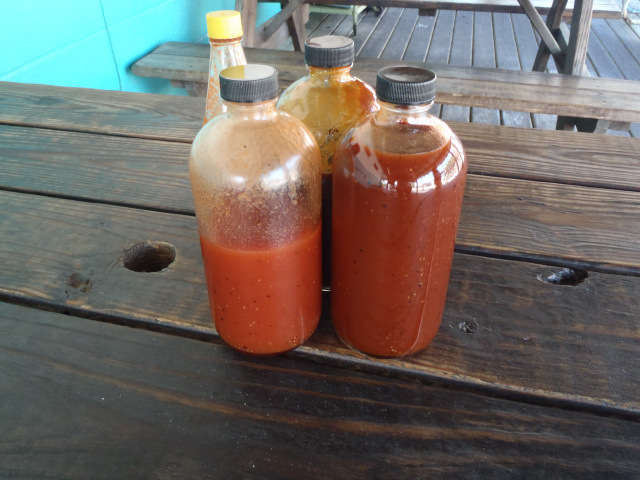 Franklin offers three sauces; a Carolina vinegar, a sweet, and an espresso. The vinegar was heavily influence by the vinegar and just wasn’t for me. The sweet was good, and of course sweet. The Espresso is said to have actual espresso in the mix, but I also tasted solid hits of Worcestershire sauce, and our table said that it tasted like Heinz 57 or similar type of flavor mixed with lots of Worcestershire. The Worcestershire flavor was a little overwhelming for me but it was surely a hit among some others. All three sauces are now available at H.E.B. grocery stores, and we picked up a couple bottles after our meal. We enjoyed Franklin a lot, and also were a bit smug as we were able to eat at an indoor table while the line remained lengthy outside. When we left I handed out a couple of cold waters we still had left in our saddlebags to an older couple in line. Once again, expecting and preparing for the wait is tantamount to enjoying the experience here. When we left Franklin, I took some familiar roads as we headed northward, first past the state capital building and then down Guadalupe. Some of the memorable locations we passed included the Mellow Mushroom, Fuzzy’s Taco Shop, The Hole in the Wall bar, Torchy’s Taco, Dirty Martin’s hamburgers, El Patio, Amy’s Ice Cream, Dan’s Hamburgers, and Stiles Switch BBQ. We didn’t have much time to relax after arriving at our hotel before we were to ride out again, but we removed the saddlebags for a little more spirited riding. We left our hotel around 6:20 PM and thankfully the heat had broken by then. Riding without the fifty pounds of loaded saddlebags the bike felt more responsive and we took Hwy 79 East from IH35 heading initially towards Taylor. We weren’t heading towards Louie Mueller, although I did think about it for a minute as my last visit was on the Saturday prior to Easter and I wanted to try there again, but our plans were to meet with my brother and sister in law in their hometown of Elgin with Cheryl and Ernest joining us as well at Southside Market and Barbeque. Mueller would have been sold out and closed for several hours by that time anyway so it wasn’t really an option. With route advice from my sister, we took FM1660 Southeast in the city of Hutto and followed a nice two lane twisting road through green fields of corn growing strongly until we turned southerly again on Texas SH95. We made a brief stop in Coupland for a photo opportunity. Among the slight rolling hills there was a small cemetery, and it was very serene as the sun was low in the western sky. We snapped a few photos then watched Ernest and Cheryl pass us by on their way to Elgin. We jumped back on the bike and followed 95 into Elgin and then headed East on 290 for one block to our destination. Elgin traditionally was a sausage focused city in regards to smoked meats, and more specifically “hot sausage” or “hot guts”, with spices like cayenne bringing the heat rather than the jalapeno based style that has been more popular of late. Regular non-spicy sausage and a jalapeno cheddar variety are the two offered through the cooked meat counter but there are other options via their meat market which is in a portion of their building. The interior is basically divided between BBQ, Meat Market, and a separate counter offering Blue Bell ice cream. You can purchase cooked meat to go, fresh meat to go, or cooked frozen meat to go, and they have a large number of choices. In addition to their meats they sell their sauces, jerky, “pecan pie in a jar”, t-shirts and logo merchandise, other products I didn’t spend the time to browse, and they even have new BBQ pits for sale. Not known for their brisket I still wanted to try them since I’ve had such a rush of BBQ lately, and especially to see how their sausage held up in comparison. I wasn’t expecting stellar brisket but I was hoping at least for some good sausage. 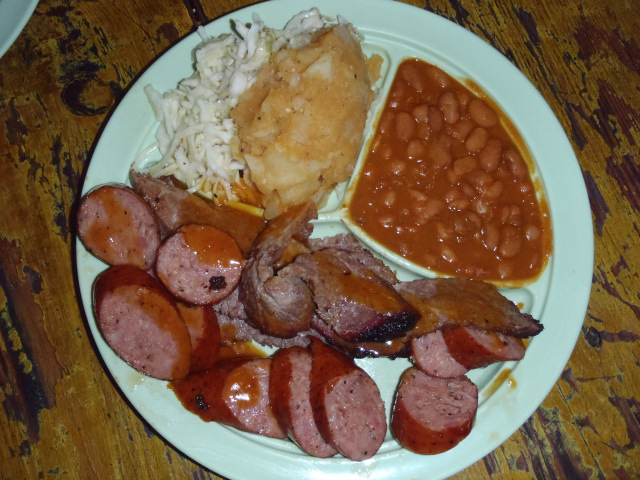 Southside claims to be the oldest BBQ joint in Texas, founded in 1882. It has not had the same owners throughout and has had a storied history, according to their website even changing hands at numerous poker games. Black’s in Lockhart has “only” been around since 1932, but has been owned by the same family during that entire time. Moving to a new location after a fire in 1983, Southside occupies a conspicuous location on 290 with plenty of traffic passing by from those driving between Austin and Houston. I’ve only eaten there a few times but have driven past en-route between the two cities easily 100 times. When I have eaten here in the past I ate sausage wraps; sausage wrapped in plain white bread. The bread works well with the juicier sausage, soaking up the flavor as you go. I had finished my meal at Franklin BBQ a little after noon, and when we walked in to Southside at 7pm we still weren’t even that hungry. Cheryl and Ernest didn’t order anything and Wayne and Terri had already eaten so Leslye and I split a three meat plate, with brisket and both regular and jalapeno cheese sausage. I watched them cut the brisket to my request of slices from the fatty side, but the cutting looked almost random. They would cut a small chunk at an angle from one end, flip it around, take a small piece or two, flip again, and cut some more small pieces. I’m used to multiple slices from the same end in long complete pieces and this was pretty haphazard looking. The price was pretty low at $11.99 for the three meats plus two sides, and the sausage was piled deep on the Styrofoam plate with an ample amount of brisket. It struggled to support the weight when I lifted it. The color on the brisket was a little grey, but the bark had a nice black char. However the bark didn’t provide much taste and even though the fatty brisket I ordered was moist there was only a faint smoke ring on a few of the pieces and it was devoid of smoke flavor. I stopped eating the brisket and took a bite into the jalapeno cheese sausage. The sausage was better. The cheddar was strong and the jalapeno light and not overpowering. The grind was good, but the snap was missing. It was better than some of the finely ground store-bought style I’ve had but also left a lot of grease behind. Maybe because I already had fatty brisket and juicy sausage at Franklin earlier in the day it just wasn’t firing up my taste buds. The meat of the regular sausage provided a complex flavor palette but it wasn’t ending up right with me. I wondered aloud what Franklin could do with these sausages by cooking them to perfection, but put that wish aside and jumped into the sides. The potato salad wasn’t very good. It was the first potato salad I can recall where the potatoes weren’t peeled. I don’t think that was the problem though, it was just a little too bland. The beans were ok. Not bad, not great, but passable fare. I had forgotten to try the sauce so I poured a little out and spread it thin with my fork. I smelled what I thought to be cinnamon but I thought maybe my senses were playing a trick on me so I passed around the sauce and the others validated my suspicion; there was cinnamon in the BBQ sauce. Honestly, it wasn’t a show stopper and maybe worth a second try. I had completely missed their hot sauce, but I had an unfinished plate of cue and just wasn’t interested in ingesting any more at this point. Our family conversed until we were gently reminded it was 9 and they were closing up shop. I thought of the contrast of Franklin, Snow’s, and Louie Mueller who can sell out of meat compared to other places like here who served until the end of the night and surely had leftover but fully cooked meat each night. What do they do with that meat? Are the first diners the next day given reheated meat, or is there another destination for the unused portions? I’m not fully sure that I want to know the answer. I think I’ll come back and try just the sausage again when I have an empty stomach but I’ve probably had enough of their brisket for a while. I like good deals, but cheap middle ground BBQ isn’t a better deal than pricier top shelf meat. We rolled back out on 95 and then back onto FM1660 but this time took a straighter line into Hutto via FM3349 which dropped us onto Hwy 79 in between Taylor and Hutto. We followed 79 back into Round Rock and to our hotel for the evening. It had been two full days now and my meals consisted only of BBQ. I was full and tired as was Leslye. She had the added uncomfort of sunburn on her back from riding earlier in the day. There was one more long day to go and we would be riding back to Houston in the heat of the day after hitting two more BBQ stops. We stopped for another quick photo opportunity in Marble Falls and then we turned southerly on RM 2147 in order to cross the Colorado river. As I passed Max Starkey dam I remembered fishing for white bass with my brother just below the dam. I made another note to try and come back some time with him again. We then hit Hwy 71 and made our way to Spicewood, Texas, home to Opie’s BBQ. There was a short line of about 10 people queued up prior to the 11am Sunday opening but as soon as the doors swung open the line moved quickly. The food presentation is unique here – in the air-conditioned building they place the cooked food on wax paper inside of an unused smoker, You choose what you want and they slice off our portion, placing it on a tray. You then move cafeteria style to choose your sides. Opie’s offer a large number of options including spicy creamed corn, tater tot casserole, and delicious looking desserts such as rocky road brownies but I would only be able to sample a small portion. The staff here was one of the friendliest I’ve seen, and they came by more than once checking on us. Todd Ashmore himself stopped by later and chatted and posed for a picture. The brisket had good bark and good flavor but in my opinion was just the slightest shade of tough. However, two in our party actually preferred it over Franklin. I would dispute that but this was still good brisket. We ordered both regular and jalapeno cheese sausage. The thin casing had decent snap and while the meat was flavorful it wasn’t overly juicy. The flavor was slightly gamey and had the telltale taste of pork. Todd confirmed our suspicions of pork. This was great sausage but it’s almost impossible to compare pork sausage directly against beef sausage. It was very hard to rate this but I absolutely enjoyed it as opposed to consuming more of the same style of sausage I’d had over the previous two days. The sauce was one of my favorites of all time. Rather than offer multiple varied choices they have a single sauce. It is a mix of vinegar and sweet and in my opinion a perfect mix. When dipping meat into the sauce it completely changed up the taste; not for better or worse but laterally changed the overall flavor. The potato salad was mayonnaise heavy but provided a very creamy texture that I still liked even though my preference is mustard based. We tried the tater tot casserole and it was interesting, but not sure I’d try it again. It had the canned style onion rings on top but by the time I had a bite they weren’t crispy. Some at our table liked them, but I also thought there was a little too much sour cream involved. The brownie we sampled for dessert was delicious and capped off a great meal. I really wanted to try more of the sides and desserts, but on a mission I had to pace myself properly. We were also treated to live music by a country gospel musician who totally brought home the idyllic Texas BBQ restaurant experience. In between second helping of beans and passing around the meat, we had a grand time. I also got to speak with Marco Oglesby, who was manning the pits, both before and after our meal. He was very nice and said he had only been doing this a few years and was still on a learning curve. He was also open to suggestions and although I couldn’t provide any I was surprised when compared to someone who believes they are at the pinnacle and are unapproachable I felt like Opie’s truly cares not just for their meat but for their customer’s experience too. I enjoyed talking to Marco and hope to get the chance to do so again. 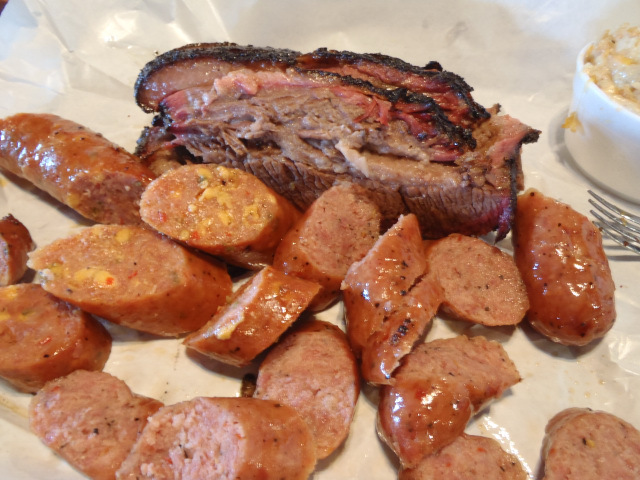 Opie’s uses mesquite wood for their smokers, which adds a little bit more bite than the mellower post oak that is more common. 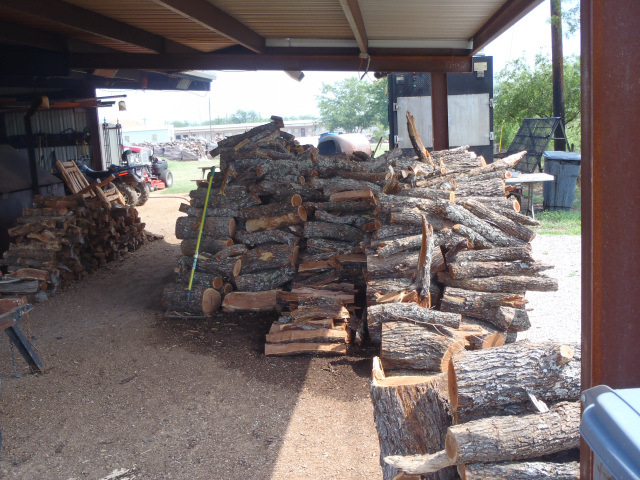 They had a large stack out back, which helped prove that they were a true wood-fired BBQ joint. They do use an Oyler style pit as one of their primary ones, which is similar to a Ferris wheel, but while the electric motor may rotate the wheel, the heat source is wood. Opie’s is a no gimmicks, great food and great staff place in a wonderfully scenic area of Texas and is a place you should not miss. As Todd Ashmore told me, “We try to have a good product and friendly staff”. We took hwy71 southeastward from Spicewood towards Oak Hill. We crossed the Pedernales “river” and I was startled by the lack of water. There looked to be only a trickle and it had been dry long enough that tall weeds had grown up. I was only able to take a quick glance to the left but the boat docks had no chance of providing any function in the near future unless monsoon level rains were to come. I have seen the river down before, but it looks like it stays down more often than it is at normal levels these days. I wonder about how all of the grown in Austin will continue to affect water levels here. I had planned to stop at a couple of scenic overlooks that I recalled from younger days, but as we rolled along what I saw instead were large subdivisions overtaking the hills. Most of these had red clay roofing tile and were looked to sport large square footage. The trees and earth had been scraped clean for this higher end housing and obscured the peaceful views I remembered. I understand growth and progress but it’s still disappointing to see the open country transitioned from houses tucked away in between the trees and blended into the scenery as opposed to asphalt paved subdivisions with miles of rooftops in place. Even more to my surprise, the scenic overlooks were unusable. Left unmaintained the trees and weeds had overgrown the stopping points and even though it would have been overlooking the subdivisions, it now was not even possible to use at all. This had us making swifter progress into Oak Hill than expected so I pulled in at “the y”. This is the intersection of Hwy71 and US 290 and houses a couple of shopping centers. There also used to be Convict Hill Restaurant that I remembered from my youth, which was located where prisoners had quarried limestone for the interior of the state capitol building in Austin. At the Y they also happened to have a Big Lots so we went in just to check on my quest for the Pocket Chair. We found the “as seen on TV” aisle and Leslye reached for the last box on the shelf but it carried no weight, and alas it was empty. However a quick look upward and we saw several display cases full. My silly quest was complete! We would now be owners of a poorly rated and possibly hardly useful tiny folding chair. We also picked up some sunblock; obviously a bit too late for Leslye but at least it could prevent further damage. We rolled out of the parking lot and quickly made a left onto Ranch Road 1826. 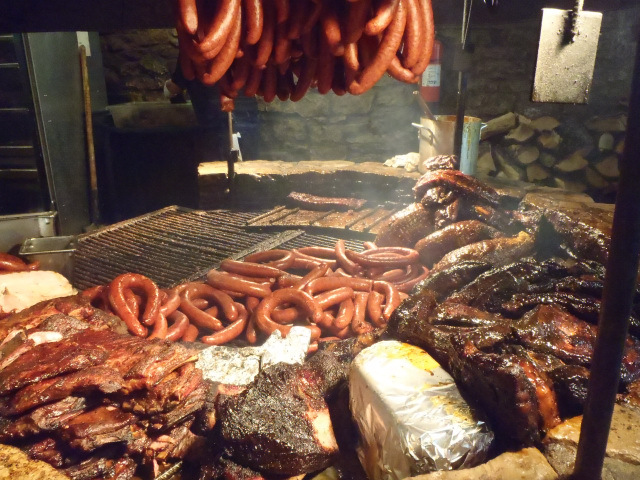 This would take us to our final BBQ destination of the weekend; The Salt Lick. On the way we made a quick unscheduled stop at Radha Madhav Dham. 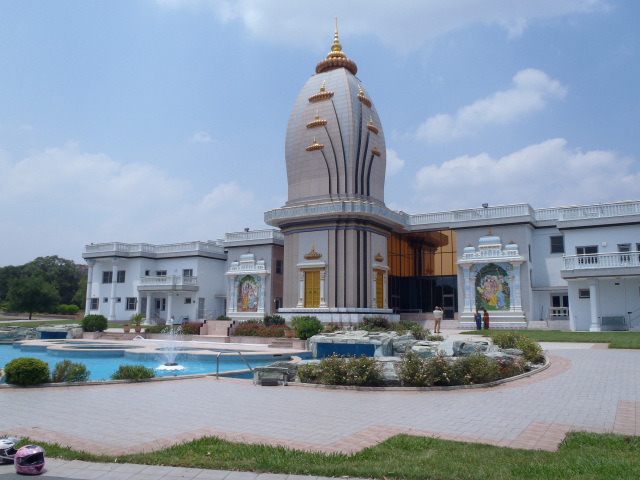 On the property is a Hindu Temple, Shree Raseshwari Radha Rani, and their website boasts that this is the largest Hindu temple and asram complex in America. As we pulled onto the interior road a deer gracefully jogged across our path and we watched as he disappeared into the woods. While I’ve been to India more than ten times, Leslye has never been so we took a few moments to walk around the property and view the exterior of the temple as well as some of the statues onsite. It was very nice and although it was not historic like the temples I have visited in India it was genuine and was very serene. We talked to a few locals who I think were curious why we were interested, and we watched a few peacocks as they pecked around. The heat continued to beat down on us though and Leslye was parched so after a few shots of the camera we jumped back on the bike. 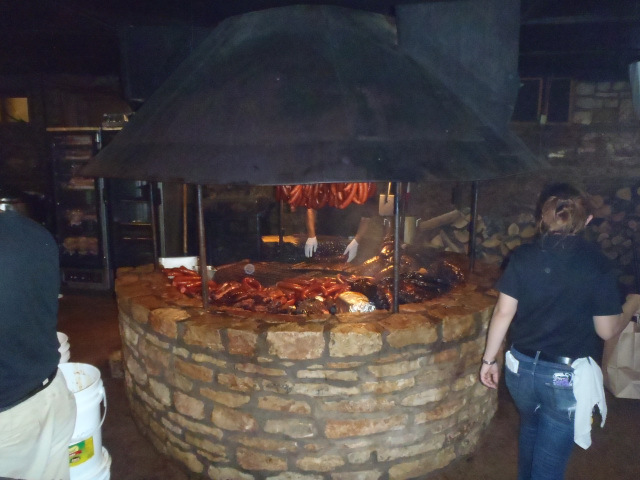 When we arrived at Salt Lick I felt like we rolled into an old west town. Coming up on the property I looked past the vineyard into the giant gravel parking lot. This was their original location and remains busy even though they have branched out into multiple locations which aren’t as grandiose. As we neared the entrance there are two separate buildings. The building on our right was the restaurant and the one to the left housed the vineyard office and offered alcoholic beverages for sale. Salt Lick has a unique cooking setup. They use circular pits inside the restaurant which are vented up and out of the ceiling. 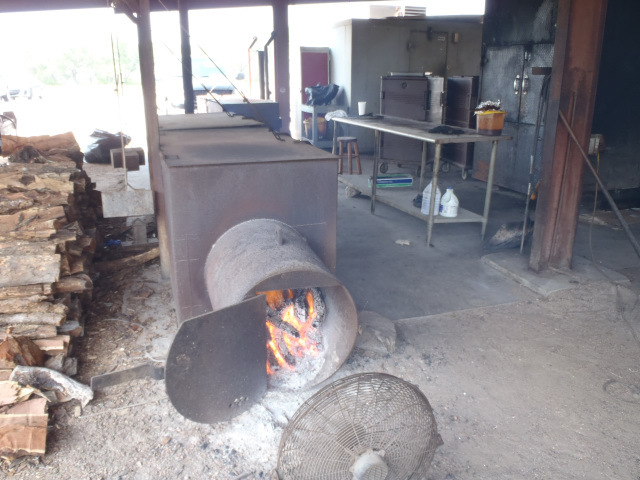 Grills are placed directly over the coals and the meat is arranged by heat requirements. It seems they try to arrange the coals to provide different ranges of heat across the grills, but this is direct cooking, and just can’t compete with true indirect smoking. Based on some research, the pre-cook some of their meats and use the indoor grills to complete the cooking process. Even though it had been less than 2 hours since our last meal, I ordered a two meat plate and requested fatty brisket and sausage. Our waiter informed us that they may be out of fatty but he would look. Within moment he returned with our requested fatty slices as part of our plate. The combo plate here comes with potato salad, beans, and coleslaw. The brisket portion was a little smaller than expected but honestly it was still more than I could bear to eat regardless of the quality. There was a light drizzle of sauce across the meat and it did help. Even though my brisket was fatty, the fat was not rendered well at all. Moist or not, when you have to tear with force in order to separate a bite from a slice, it is not a good sign. The bark was pretty good but I think they cook the brisket too fast here and was not impressed. The sausage was fair but the grind, casing, and internals tasted like store bought quality. Here also the sauce helped and I did finish most of the portion but to me it also could use a longer and slower smoking. This just wasn’t a good example of true Texas BBQ. The potato salad was one of my least favorites. Rather than a pale white from mayonnaise or a yellow from mustard, it had an orange tint. I presumed this to be from BBQ sauce. It tasted to me basically of mostly potatoes with a touch of BBQ sauce and a tiny amount of mayo. It does ring of old school German potatoes, prior to good refrigeration, but hey – we’ve come a long way and I prefer a mustard based cold potato salad. 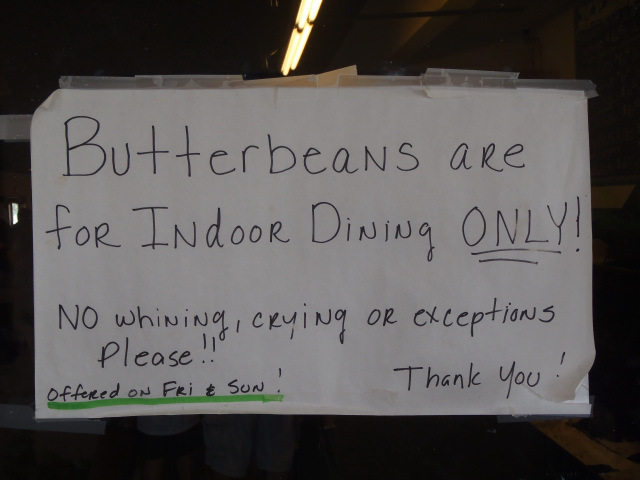 The ranch beans were fair but did not add to the experience. The coleslaw was heavy with vinegar and had small seeds which I think were sesame. I was not a fan. The table next to us provided for interesting eavesdropping. First they talked about someone having a quandary with a dead body and that you can’t just bury it in Texas. One said they would just take it to Louisiana while the other mentioned muriatic acid. I wasn’t sure if they were talking about a class project, something sinister, or something I had missed but as they continued it seemed apparent that a friend or family member had passed away. They talked of wills and how assets are handled in Texas and my attention drifted away as the content began to bore me when I realized there was not some more interesting angle. The younger lady at the table tried to explain to the others about Texas BBQ. I withheld myself from interrupting but she was so far off base that it was painful to listen to. We, well mostly I, drank an entire pitcher of iced tea as we attempted to let some of the heat of the day dissipate. When we arrived back at the parking lot there was a Goldwing parked next to the BMW. It looked massive to me, in height, length, and girth. Both pilot and passenger had cup holders filled with drink, and the rear passenger had armrests as well. With our bellies absolutely stuffed we rolled out. for the next few hours I was subjected to probably the most irritating ride of my life thus far. The heat was beating down on us, and our arms were exposed with the exception of a wet spray of sunblock. My head was sweating and itchy enough that I kept trying to shake my helmet but it was to no avail. Then there was the wind: over 20mph of cross winds would cut at us incessantly. Occasionally abating enough that the bike would shift to the right, but then hitting us again with a blast strong enough that I would ride at an angle. The wind in my helmet was brutal; to the point of me ears physically hurting not only from the noise but from the air pressure. My helmet was being buffeted enough that my vision would often be blurred, and I was getting outright cranky. We stopped in Elgin and again in Brenham trying to get a break from the uncomforting ride but it was only temporary. I was at the point of yelling profanities in my helmet before we made our turn onto FM 1488 and finally had a bit of the wind behind us. I wasn’t well prepared for either the heat or the wind, and this made the ride home extremely unpleasant. While the weekend was a rollercoaster of good and mediocre barbecue, the ride home didn’t put a proper ending on our experience. I was still a relative novice to motorcycle touring and I would remember to be better prepared for the heat and the wind in the future. Tags: Franklin, Opie's, Salt Lick, Southside Market.